Can you believe that it’s already April? Early 2015 has been a very busy time at our HeartFelt Silks studio! There have been group felting classes and private lessons at our retail/teaching space in Hudson, WI, and workshops at The Textile Center. Lots of new projects on the work table, from new styles of felted garments, to experimenting with new techniques, to eco-dyeing. Many uniquely dyed scarves and felted accessories went home to collectors of Robbin Firth originals this season. Plus, lots of new Palm Washboard felting tools are being made by Harry in the woodshop, to be shipped all over the world. And if that’s not busy enough, I have been incredibly busy with preparations for a month+ of traveling and teaching all around the United Kingdom, and Ireland too! And, for those who have been waiting — announcement of upcoming workshops in Florida and Canada is coming soon! If you are in the area, come see us at Shepherd’s Harvest Festival, May 15-17, 2015, in Lake Elmo, MN. We will be doing felting demos, and the entire lineup of Palm Washboards will be for sale at the festival. Here’s what we have been up to recently. 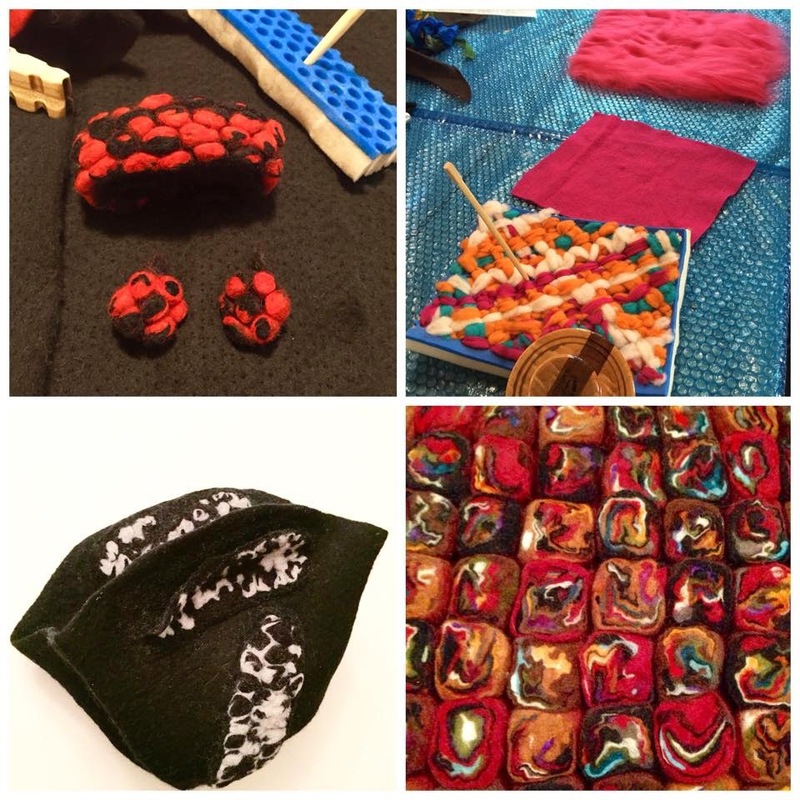 Follow us on Facebook for daily updates from the studio, as well as felting tips and techniques. Some of the most popular classes lately are the Felted Raw Wool Locks Wrap workshops. What could be better than playing with gorgeous wool locks and watching them transform into dramatic and organic-looking showstopper wraps! Interested in a group or a private class with Robbin Firth at the HeartFelt Silks Studio? Get in touch! When I am not teaching, you will find me in the studio, creating luxurious garments and accessories out of the finest silks and wools. I love combining silk I hand-dye myself with beautiful merino wool to make stunning fiber art pieces for beautiful women. Select hand-dyed silks and felting kits are available from the HeartFelt Silks online shop. Here are just a few of the gorgeous women modeling their new HeartFelt Silks garments. Interested in owning a HeartFelt Silks original? Please get in touch to inquire about current inventory or to order a custom piece. This season, I am offering classes on the UPWOLFING felting technique for the first time. If you haven’t experimented with this technique yet, you are in for a real treat. Just look at all the fun possibilities, from adding extraordinary detail to handbags, vessels, or other felt objects, to creating felted jewelry, UPWOLFING takes your felting pursuits to a new level. HeartFelt Silks is proud to be a US distributor of select UPWOLFING products, and you can find them in our online shops. Every day, there is something new happening at the HeartFelt Silks Studio. My eco-dyed scarves have been in high demand this season, and the studio has been frequently infused with the beautiful scent of eucalyptus (used in my eco-dyeing!) Unwrapping the bundles to reveal the beauty within is always magical! I also hosted a pop-up eco-dyeing class that was a great success with my fantastic students. In the meantime, Harry has been busy making not only Palm Washboards but also custom hat blocks. The hat blocks Harry creates are always made-to-order. Each one is lovingly and carefully handcrafted out of a combination of beautiful woods. Not only are the hat blocks of great use to beginner and advanced millinery artists and feltmakers, but on their own they are sculptural art objects. Let us know if you are interested in custom-ordering a handcrafted wood hat block by Harry Firth. And no day is complete in the HeartFelt Silks adventure without a visit and some help from one of our many beloved animals! Here’s Mr. Moose doing quality control while I work. Winter and Spring 2015 Felting Classes with HeartFelt Silks 2018 HeartFelt Silks comes to the UK and Ireland Summer 2015!